appeal – it’s not narrowed by gender, age or interest. It’s a game for everyone. 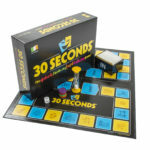 The 30 Seconds Adult Version together with the newly produced Junior Version, is published and distributed by our company Woodland Games Ltd (based in Cork) in the Republic of Ireland. Click here for Junior version. This is the most fun game ever. I played it with friends at a 30th and my sides hurt from laughing. It is really easy to learn and its great for a group. I highly recommend it as the perfect family Christmas game or party game.